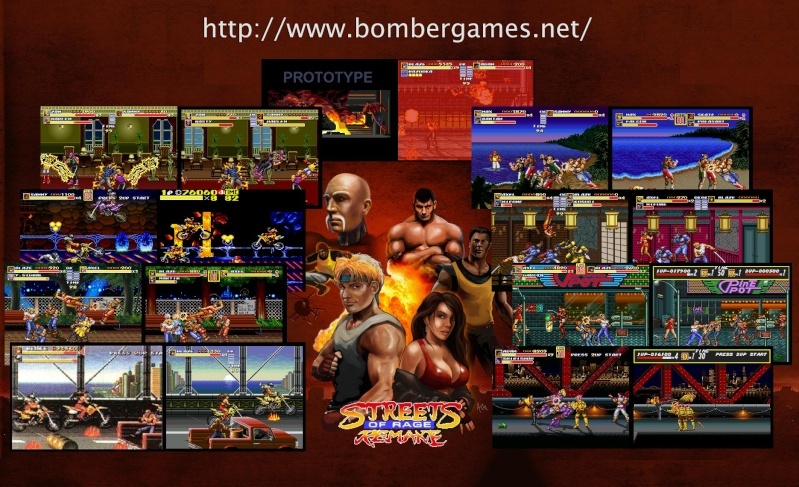 Streets of Rage Remake is a fan made trilogy crafted by the talented group Bombergames with the help of their community. After 8 long years of development the game was finally released in it's complete state in 2011, although shortly after a cease and desist order was issued by SEGA, it was already too late. The game is out and can be found with a quick google search. This masterpiece takes all three games of the series and compiles them into one game taking the elements (with a few omissions) from the trilogy. I will be doing a full review on the game at a later time, until then ENJOY! It's too bad that SEGA Europe pulled a jerk move and order a C&D from Bombergames. I ask you, what kind of self-respecting company does that? That made me think that SEGA was one of the worst video game companies ever. Sonic Fan Games HQ were wondering if it could happen to them because of this. Honestly I think SEGA pulled a smart move. I don't like it but let's be real, if SEGA wanted to kill the project we wouldn't have seen a release at all, keep in mind B did contact SEGA about this and they stayed silent. If you asked me this was all planned out. I think the Cody boss battle was the main factor. If they didn't shut the project down, it would have been associated with Sega, while it retained a Capcom copyright within. It was definitely the best move they could have made in regards to legality. Plus, 8 years of development and they didn't shut it down until a week after the final release? Sega could have moved in much sooner. Now, we know of a place where we can download the final release(and now some updates) of the game, whereas it'd be much trickier to find otherwise. I dunno if a little jab at capcom was an issue to be honest. Companies do that all the time, like the guile statue in real bout I think it was or stuff like dan hibiki, Mari-Oh etc. Yeah, but in this case it was too spot on, whereas there's usually something off about the appearance and name. To be honest, I don't think that looked like Cody from Final Fight. Yeah nothing to cause concern anyway. It was literally just a jab at the character. Admittedly it's been a while since I took that route, but still, a fan work that implies something could look bad for an official company. In the end the public will never know the truth behind this, but the game is still available, and has had a couple updates since "Sega shut it down" anyway. One could only guess there was some form of secret collusion, since Sega seemed to know about it from the start, but still let the official "final" version release, 8 years later. Most projects are shut down much sooner, some near the last second, but none after the company has known about it for 8 years. Any other company would have snuffed this within the first 2-3, if they even let it go that far. What I'll never understand is how a 4th Streets of Rage didn't happen. Sega was the only company that made good 3D beat 'em ups early on, starting with Die Hard Arcade. No idea why they thought they'd have to outsource a SoR4. I am a new member to this website. I want to start by saying this website is simply amazing and i hope it never goes away. Playing Sorr blew my mind, because ive been playing Bor but this is completely different. I also admire all the efforts of the team who made it. It is wonderful that many games we love to play still live on with a solid community and fan-base. I support 2D Beat `em up games 100% ! They have become a part of my life. I play on my Xbox360, android, and windows platforms. Im also into collecting rare games. Peace be with you all! Welcome to the forums, Beat Em Ups are indeed part a of a beautiful genre. I wish SoRR had online play! If only Zan's unused grab attack was discovered before SORRv5 came out. Maybe they are not on the site yet. Anyhow, i now want to make my own Streets of Rage character. First of all, i want to say this website is awesome. The reason why Sega allowed for Sor remake is because it totally does justice to the game. The music is great, and the running moves with the steel pipe are cool. All the new moves and smart AI for the enemies makes the game never boring. This is definitely one of the hidden treasures on the internet. I want to play all the mods one by one so i hope this site will always be active. And i also support you guys all the way! I have also been playing Sengoku Denshou (Japan) on BizHawk emulator. This game is not known by many people but it rocks! I also play Streets of Rage on sega CD and mame (Mega- Tech) Can we please have a Sengoku Denshou inspired mod? I check this forum every day from now on, but I don't play Streets of Rage Remake as much as I used to. I will continue my own Sorr character. I also joined the Sorr facebook page, im hoping to find some active members. When do u think this webpage will get an update again? How come you dont play as much Candra Software? Did you finish all the Mods? I still have a lot of SORMaker mods to play. It just feels different from the real Streets of Rage games in some ways. the hacks might feel more like real Streets of Rage. Besides what choice do we have? There's nothing else that will feel like real Streets of rage, this is as close as it gets lol. -It seems to be harder make thrown bodies hit other enemies. -Jack and Electra have their wakeup invincibility, even if they don't use their special intros. -Barbon can now break out of grabs with his high kick. -SOR3 Signal and SOR3 Bongo's slide/roll attack have their invincibility removed for the better. -In older versions of SORRv5, some bosses are vulnerable to the double vault re-grab loop. But theres nothing else to play with similar SOR feel ? Im pretty happy with this. Besides, it would be boring if SOR was always the same with no changes. Its possible that anyone can make their own remake. That's the best part about it. Ok, i apologize for that. I promise to be a responsible user of the forums starting from now. When do u think we can see an update on the main webpage? Zak you don't need to triple post, you should be able to edit your posts and put all you want in that one.